Purchase a set of 4 eligible Blizzak winter tires and get rewarded. Don’t let the snow and ice catch you off guard this winter, be prepared with a new set of Bridgestone tires. Get $70 By Mail* on a Bridgestone Visa® Prepaid Card** when you buy a set of 4 eligible Bridgestone Blizzak tires. Offer valid November 16 – December 17, 2017. *Offer good in the U.S. only. Void in Puerto Rico. Claim form required. Certain restrictions and limitations apply. For eligible tires and complete details, see your participating Bridgestone retailer or BridgestoneTire.com. Eligible tires must be purchased from a participating Bridgestone retailer’s inventory August 10-October 8, 2017. OFFER EXCLUDES COSTCO AND GM PURCHASES. Limit 1 reward per each set of 4 eligible tires. Limit 2 claims per household, customer or address. Not redeemable for cash. Call 1-877-TIRE USA to find a retailer near you. Cannot be combined with any other offer. **Prepaid Card is issued by The Bancorp Bank pursuant to a license from Visa U.S.A. Inc. and may be used everywhere Visa debit cards are accepted. The Bancorp Bank; Member FDIC. Cards are issued in connection with a reward. Card terms, conditions and expiration apply. All trademarks and brand names belong to their respective owners. Use of these trademarks and brand names do not represent endorsement by or association with this card program. All rights reserved. 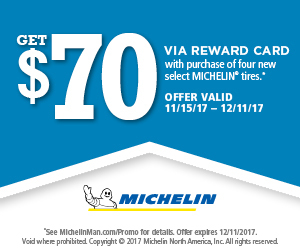 Get a $70 MasterCard® Reward Card after submission* with purchase of four new MICHELIN® passenger or light truck tires. Offer valid 11/15/17-12/11/17. *See redemption form for complete offer details. Offer expires 12/11/2017. Void where prohibited. The Reward Card expires six (6) months after issuance. No cash access. Fees apply. Reward Card issued by U.S. Bank National Association pursuant to a license from MasterCard International Incorporated. MasterCard is a registered trademark of MasterCard International Incorporated. Copyright © 2017 Michelin North America, Inc. All rights reserved. *Offer valid in the U.S. only. Void in Puerto Rico. Claim form required. Certain restrictions and limitations apply. For eligible tires and complete details, see your participating Firestone retailer or FirestoneTire.com. 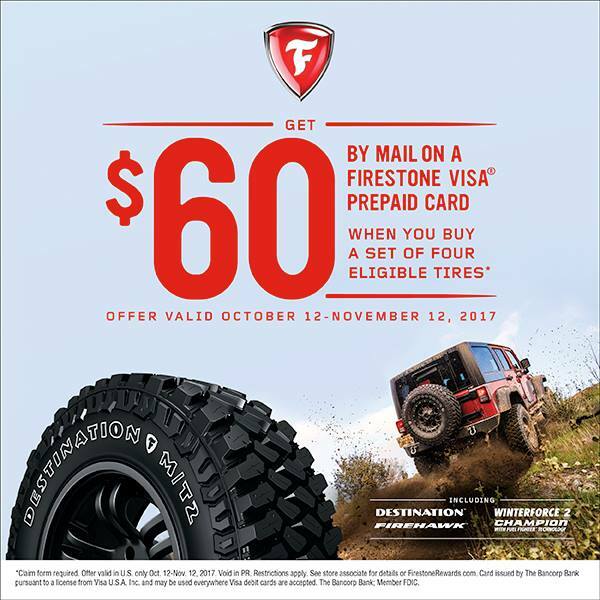 Eligible tires must be purchased from a participating Firestone retailer’s inventory October 12–November 12, 2017. OFFER EXCLUDES COSTCO PURCHASES. Limit 1 reward per each set of 4 eligible tires. Limit 2 claims per household, customer or address. Not redeemable for cash. Call 1-877-TIRE USA to find a retailer near you. Cannot be combined with any other offer. **The Visa Prepaid Card is issued by The Bancorp Bank pursuant to a license from Visa U.S.A. Inc. and may be used everywhere Visa debit cards are accepted. The Bancorp Bank; Member FDIC. Cards are issued in connection with a reward See claim form for details. Card terms, conditions and expiration apply. All trademarks and brand names belong to their respective owners. †To receive the $100 Firestone Visa Prepaid Card by mail you must purchase a set of 4 eligible Firestone tires with your new or existing CFNA credit card. CFNA accounts subject to credit approval. The Firestone Visa Prepaid Card cannot be used to pay any CFNA credit card balance. The Bancorp Bank is not affiliated in any way with this credit card offer and does not endorse or sponsor this credit card offer. Participating retailers only. After Submission* When You Buy 4 New BFGoodrich® Passenger or light truck Tires. Buying Online? No additional submission required. Purchase must be completed between 06/26/2017 and 07/16/2017. 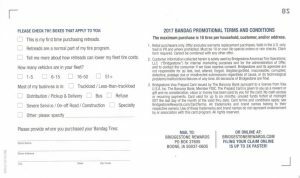 Limit of one (1) redemption request ($50 MasterCard® Reward Card) per purchase of four (4) new BFGoodrich® passenger or light truck tires. Limit of three (3) redemptions per household. Must be at least 18 years of age or older at the time of purchase to be eligible. All requests must be postmarked or received on or before 08/16/2017. Please allow four (4) to six (6) weeks for delivery of the $50 MasterCard® Reward Card via mail. Sales to Original Equipment manufacturers, fleets, wholesalers, business accounts and purchases for resale are not eligible for this promotion. Original Equipment tires DO NOT qualify. Purchases from warehouse clubs (e.g., Sam’s Club, BJ’s, Costco), mass merchandisers (e.g., Sears) and national retailers (e.g., Discount Tire, Tire Kingdom, NTB, Merchant’s, Big O and Southeast Toyota) are excluded from this promotion, but may be eligible for coverage under a store-specific promotion (see individual store[s] for details). In addition, purchases from any nonparticipating dealers are not eligible for this promotion. Tampering with, altering or falsifying purchase information constitutes fraud. All decisions made by Michelin (or its authorized representatives) relating to the validity of any submissions are final and binding. This promotion is subject to all federal, state and local laws and regulations. BFGoodrich reserves the right to modify or discontinue this offer, products and/or services at any time for any reason. No cash refunds. Please retain copies of the materials you submit. All requests become the property of Michelin North America, Inc., and will not be returned. BFGoodrich is not responsible for any lost, late, stolen, damaged, misdirected, incomplete, incorrect or illegible mail. No postage-due requests. For questions regarding this promotion, please call 1-800-233-5961 Monday through Friday between 8:00 a.m. and 8:00 p.m. ET. 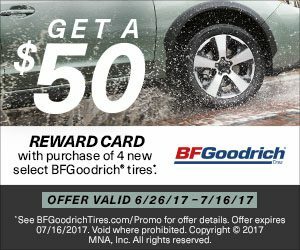 Please reference the 2017 BFGoodrich Summer Promotion when calling. Offer may not be assigned, traded, sold or combined with any other BFGoodrich offer. THIS OFFER IS NOT VALID WHERE PROHIBITED OR RESTRICTED BY LAW. The Reward Card cannot be reloaded with additional funds, nor can it be used at an ATM. Reward Card expires six (6) months after issuance. No cash access. Fees apply. For complete terms, conditions and fees, see the Cardholder Agreement in your card package. Reward Card issued by U.S. Bank National Association pursuant to a license from MasterCard International Incorporated. MasterCard is a registered trademark of MasterCard International Incorporated. Get a $70 MasterCard® Reward Card after submission* with purchase of any set of 4 new MICHELIN® passenger or light truck tires. 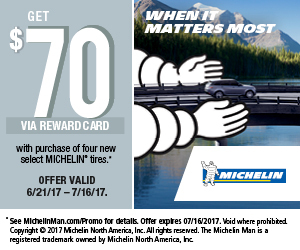 Purchase any set of 4 new MICHELIN® brand passenger or light truck tires between 06/21/17 and 07/16/17. Offer valid only at dealers with a SPECIAL OFFER next to their name on the tire dealer locator. Check the status of your Reward Card here or call 866-212-9619. *Offer valid for residents of the United States only who purchase from a participating dealer located in the fifty (50) United States, District of Columbia (“U.S.”) and U.S. Territories (Puerto Rico, Guam and U.S. Virgin Islands). Purchase must be completed between 06/21/2017 and 07/16/2017. 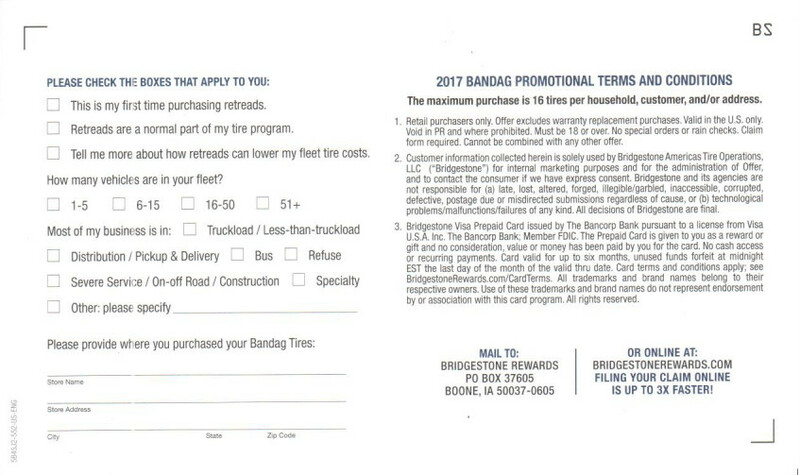 Limit of one (1) redemption request ($70 MasterCard® Reward Card) per purchase of four (4) new MICHELIN® passenger or light truck tires. Limit of three (3) redemptions per household. Must be at least 18 years of age or older at the time of purchase to be eligible. All requests must be postmarked or received on or before 08/16/2017. Please allow four (4) to six (6) weeks for delivery of the $70 MasterCard® Reward Card via mail. Sales to Original Equipment manufacturers, fleets, wholesalers, business accounts and purchases for resale are not eligible for this promotion. Original Equipment tires DO NOT qualify. Purchases from warehouse clubs (e.g., Sam’s Club, BJ’s, Costco), mass merchandisers (e.g., Sears) and national retailers (e.g., Discount Tire, Tire Kingdom, NTB, Merchant’s, Big O and Southeast Toyota) are excluded from this promotion, but may be eligible for coverage under a store-specific promotion (see individual store[s] for details). In addition, purchases from any nonparticipating dealers are not eligible for this promotion. Tampering with, altering or falsifying purchase information constitutes fraud. All decisions made by Michelin (or its authorized representatives) relating to the validity of any submissions are final and binding. This promotion is subject to all federal, state and local laws and regulations. Michelin reserves the right to modify or discontinue this offer, products and/or services at any time for any reason. No cash refunds. Please retain copies of the materials you submit. All requests become the property of Michelin North America, Inc., and will not be returned. Michelin is not responsible for any lost, late, stolen, damaged, misdirected, incomplete, incorrect or illegible mail. No postage-due requests. For questions regarding this promotion, please call 1-866-212-9619 Monday through Friday between 8:00 a.m. and 8:00 p.m. ET. Please reference the 2017 Michelin Summer Promotion when calling. Offer may not be assigned, traded, sold or combined with any other Michelin offer. THIS OFFER IS NOT VALID WHERE PROHIBITED OR RESTRICTED BY LAW. The Reward Card cannot be reloaded with additional funds, nor can it be used at an ATM. Reward Card expires six (6) months after issuance. No cash access. Fees apply. For complete terms, conditions and fees, see the Cardholder Agreement in your card package. Reward Card issued by U.S. Bank National Association pursuant to a license from MasterCard International Incorporated. MasterCard is a registered trademark of MasterCard International Incorporated. See participating Pete’s Tire Barns Commercial Sales staff or tire sales and service center for details. Offer excludes national account sales. Reward will be fulfilled with a Bridgestone Visa Prepaid Card by mail. All rebate claims must be postmarked no later than August 10, 2017. Proof of purchase must accompany all claims. 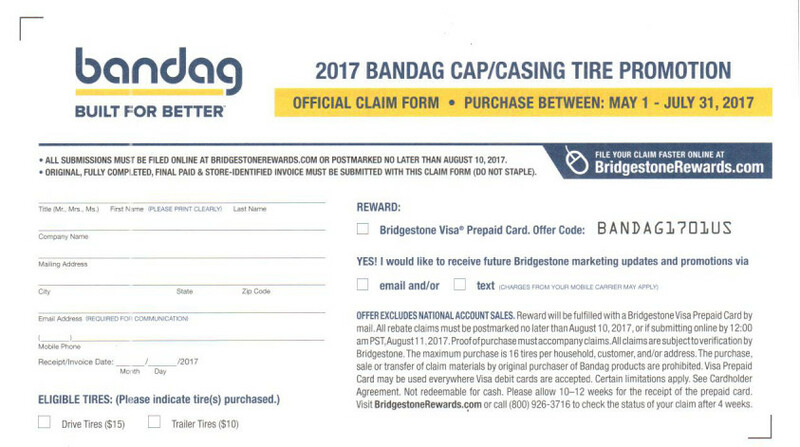 All claims are subject to verification by Bridgestone. The maximum purchase is 16 tires per household, customer and/or address. 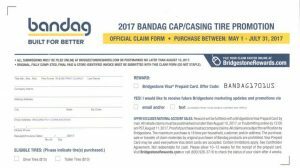 The purchase, sale or transfer of claim materials by the original purchaser of Bandag products are prohibited. Visa Prepaid card may be used everywhere Visa debit cards are accepted. Certain limitations apply. See Cardholder Agreement. Not redeemable for cash. Please allow 10-12 weeks for the receipt of the prepaid card. Visit bridgestonerewards.com or call (800) 926-3716 to check the status of your claim after 4 weeks. Pete’s Tire Barns is pleased to announce that we have added aluminum wheel polishing for commercial truck wheels to our product lineup. 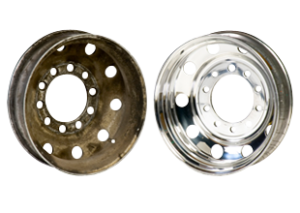 With the purchase of two new VIS-Polish automated wheel polishing systems, we can now restore your road weary truck wheels to their original shiny luster. Through cleaning, sanding and polishing, we can now restore aluminum truck and bus wheel rims to a mirror-like finish. Below is a picture of what the wheels look like before polishing and then how they appear when polished. 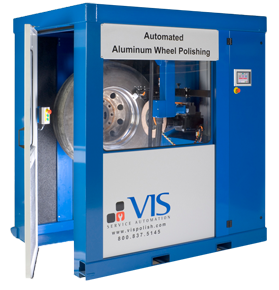 The VIS-Polish system is a automated cleaning and polishing system designed for use on commercial truck and bus wheels. Retail purchasers only. Offer excludes commercial, eet and group purchases, employee changeovers and warranty replacement purchases. Valid in the U.S. only. Void in PR and where prohibited. Must be 18 or over. No special orders or rain checks. Claim Form required. Cannot be combined with any other offer. Customer information collected herein is solely used by Bridgestone Americas Tire Operations, LLC (“Bridgestone”) for internal marketing purposes and for the administration of Offer, and to contact the consumer if we have express consent. Bridgestone and its agencies are not responsible for (a) late, lost, altered, forged, illegible/garbled, inaccessible, corrupted, defective, postage due or misdirected submissions regardless of cause, or (b) technological problems/malfunctions/failures of any kind. All decisions of Firestone are nal. Firestone Visa Prepaid Card issued by The Bancorp Bank pursuant to a license from Visa U.S.A Inc. The Bancorp Bank; Member FDIC. The Prepaid Card is given to you as a reward or gift and no consideration, value or money has been paid by you for the card, beyond the cost of the required tire purchase. No cash access or recurring payments. Card valid for up to six months, unused funds forfeit at midnight EST the last day of the month of the valid thru date. Card terms and conditions apply; see FirestoneRewards.com/CardTerms. All trademarks and brand names belong to their respective owners. Use of these trademarks and brand names do not represent endorsement by or association with this card program. All rights reserved. The Bancorp is not af liated in any way with this offer and does not endorse or sponsor this offer. OFFER EXCLUDES COSTCO AND GM DEALER PURCHASES. Reward will be fulfilled with a Firestone Visa Prepaid Card by mail. Limit 1 reward per each set of 4 tires purchased, limit 2 rewards per household, customer or address. Visa Prepaid Card may be used everywhere Visa debit cards are accepted. Certain limitations apply. See Cardholder Agreement. Not redeemable for cash. Please allow 10-12 weeks for the receipt of the prepaid card. Visit FirestoneRewards.com or call (800) 903-9838 to check the status of your claim after 4 weeks.